Are you tired of feeling bad? Do you want to find a natural way to end depression? Are you frustrated with the drugs which make you dependent? Now YOU can take time out to super-boost your positive mind-set and feel great! If you want to feel better and you are ready to be in control and wake up tomorrow feeling happy and interested in life… please get this hypnotherapy audio now! Hypnosis can change your life, very quickly. Dr Janet Hall. Clinical Psychologist and Hypnotherapist of over 35 years has seen her clients go from being hopeless and even suicidal, to feeling good again, loving life, and feeling hopeful about their future. Please know that Hypnotherapy is a tool and not a magic wand. Some people do need to continue to take antidepressants and continue with long term counselling. HOWEVER, most people who are overwhelmed, sad and hopeless need to change the way their subconscious mind is accessing thoughts and feelings, which creates the chemical state that leads to depression. Your thoughts, memories and traumas can create a chemical depression. When you change your thoughts, and release the emotional memories, your brain will begin to change the chemical state that it is creating in your body and you will feel better! You can feel good again by creating the ideal brain chemistry for mental health. This recording will work with your unconscious mind to release the attitudes that can cause depression. 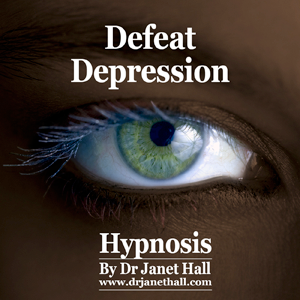 Hypnotherapy is Not A Miracle Cure For Depression, But It Is A Powerful Aid To Recovery! You will hear Positive Suggestions for Healing Relaxation. By listening, over time, to the beneficial effects of both positive hypnotic suggestion and deep and profound relaxation you will access your unconscious self-healing mechanisms. So, if you’re serious about wanting to stop feeling depressed then you need to get a copy of “Defeat Depression With Hypnosis” right now!